HeLa cells were formaldehyde-crosslinked and chromatin was prepared and digested as described in Section A of the SimpleChip® Kit protocol using Micrococcal Nuclease for digestion. DNA was purified as described in Section B. 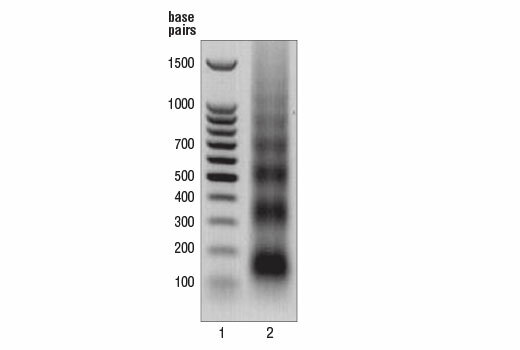 10 μl were separated by electrophoresis on a 1% agarose gel (lane 2) and stained with ethidium bromide. Lane 2 shows that the majority of chromatin was digested to 1 to 5 nucleosomes (150 to 900 bp). Micrococcal nuclease is a relatively non-specific endo-exonuclease derived from Staphylococcus aureus. Active in the pH range of 7.0-10.0, this product digests double-stranded, single-stranded, circular, and linear nucleic acids. In the SimpleChIP® Enzymatic Chromatin IP kit assay, following cell lysis, the chromatin is fragmented by partial digestion with micrococcal nuclease to obtain chromatin fragments of 1 to 5 nucleosomes in size. Enzymatic digestion of chromatin is much milder than sonication and eliminates problems due to variability in sonication power and emulsification of chromatin during sonication, which can result in incomplete fragmentation of chromatin or loss of antibody epitopes due to protein denaturation and degradation. This product is offered to conveniently provide additional micrococcal nuclease when fragmenting chromatin with our SimpleChIP® (#9002, #9003) and SimpleChIP® Plus (#9004, #9005) Enzymatic Chromatin IP Kits. These kits provide all the reagents required for performing 6 chromatin preparations (or optimizations) and 30 chromatin immunoprecipitation (ChIP) assays, however there are instances where extra micrococcal nuclease is desired. Use during chromatin fragmentation in chromatin immunoprecipitation (ChIP) assays as directed in the protocols for the SimpleChIP® and SimpleChIP® Plus Enzymatic Chromatin IP Kits. For proper chromatin digestion, micrococcal nuclease requires the use of SimpleChIP® Lysis Buffers A & B #14282. Supplied in 10 mM Tris-HCl (pH 7.5), 50 mM NaCl, 1mM EDTA and 50% glycerol. Store at –20°C. Do not aliquot the product. This product is stable for 12 months.